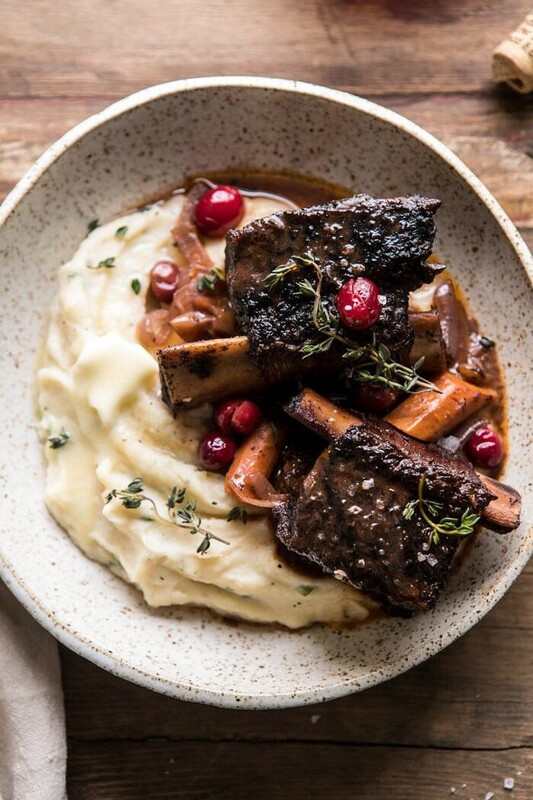 Red Wine Cranberry Braised Short Ribs. 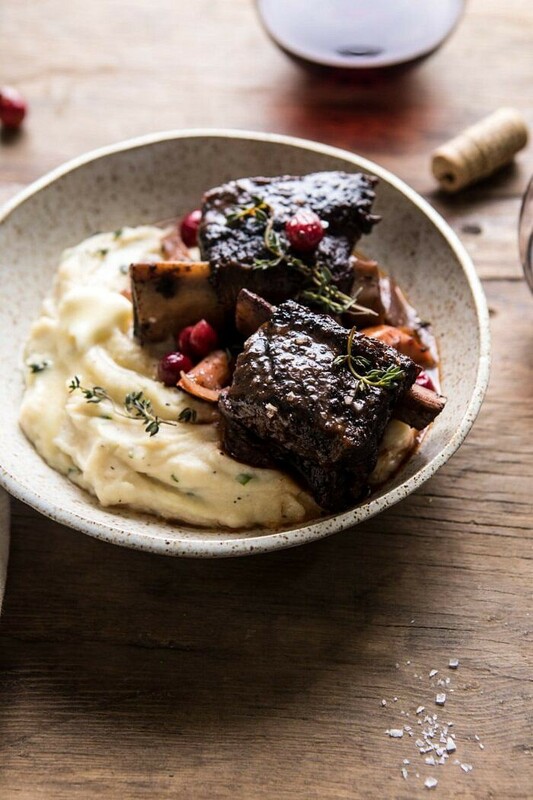 Slow cooked short ribs in red wine with fresh herbs and sweet cranberries. If there’s one cozy holiday meal you need to be making, it’s these braised short ribs. They’re a one pot and done kind of dinner, festive, and totally delicious. Serve these over a bed of creamy mashed potatoes and you’ll have the perfect dinner for a cold night in. I’ve been waiting for Thanksgiving week to be here for so long. This is always such a fun week with so much excitement in the air. I’ve never put a ton of pressure on myself to make Thanksgiving perfect. I think this is why I am able to look forward to it so much. All of my brothers are in town (well one arrives tomorrow). I’m excited to spend some time with them, take a minute to soak everything in, and be thankful for all this year has had to offer. It’s been a big year of growth here at HBH, and I’m so thankful to be doing what I love each and every day. It’s been go, go, go for months now, so I haven’t really had the chance to organize the studio and make it just right. Plus, we’re still waiting on furniture for the upstairs loft and office. Regardless, on Saturday afternoon I finally decided to put down my computer and spend a couple of hours organizing and tidying up around the studio to prepare for Thanksgiving. It was fun to spend a little time styling out the space. Thanksgiving will be our first “big dinner” here, so I’m getting excited! I may or may not have already set my tables. Anyway, with all of my family in town, that means I need easy meals that everyone will love. Enter these tangy red wine braised short ribs. This recipe has been my go-to for about a year now. I first made these ribs back in December of last year. And ever since then I’ve been making them for big crowds. My brothers love short ribs, so this is the perfect dinner to serve this week…especially with snow in the forecast. Nothing is better on a snowy night than a dinner of slow cooker short ribs. Plus, they are so easy to make. Just one pot, set the slow cooker, and come home to dinner. EASY. Like most (good) short rib recipes, this one starts out by searing the ribs in a super hot skillet. Trust me, I know how much of a turn off this is in any recipe. But searing the ribs is an essential step and will give you a tender, flavorful short rib every time. I know you might not want to dirty the pan or deal with the grease splatter, but if you want a delicious meal, take the extra ten minutes and sear the ribs before adding them to the slow cooker (or oven). Once the ribs are seared, you pretty much just throw all remaining ingredients into the slow cooker and cook all day long. Low and slow is key with short ribs, so I recommend cooking the full six hours on low. You can slow cook these in the oven as well. The major flavor for these shorts come from dry red wine, fresh herbs, and tangy cranberries. Now, I know the cranberries might be throwing some of you off, but I promise, the cranberries in this recipe are delicious. 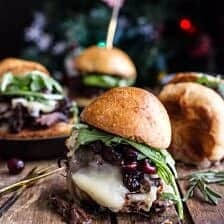 One of my favorite things to do this time of year when cranberries are in season is to pair them with beef and red wine. 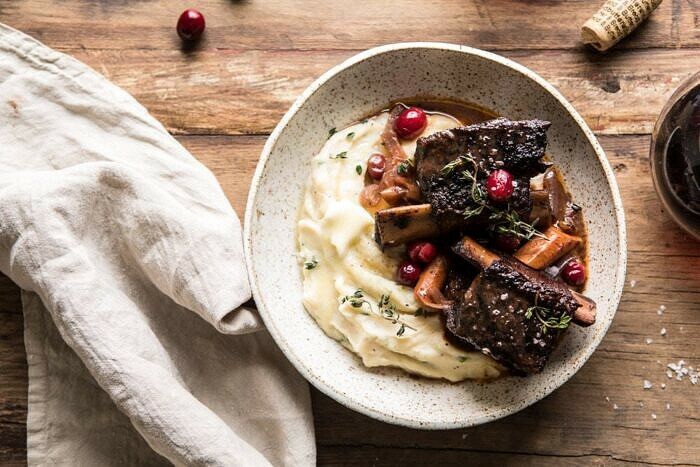 Something about the combo of cranberries, red, wine, and beefy short ribs are just so good. It feels very fancy, very French, and when served over creamy mashed potatoes, it’s really one of the best, coziest meals there is. I actually made this exact recipe yesterday, for Sunday night dinner with the family. It was the perfect dinner to enjoy on a cold November night. If you need something warm and hearty to serve this week before Thursday’s feast, I highly recommend these short ribs. If you make these ribs be sure to leave a comment and/or give this recipe a rating! Above all, I love to hear from you guys and always do my best to respond to each and every comment. And of course, if you do make this recipe, don’t forget to also tag me on Instagram! Looking through the photos of recipes you all have made is my favorite! 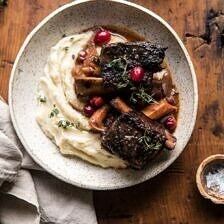 Red Wine Cranberry Braised Short Ribs from Half Baked Harvest on Vimeo. 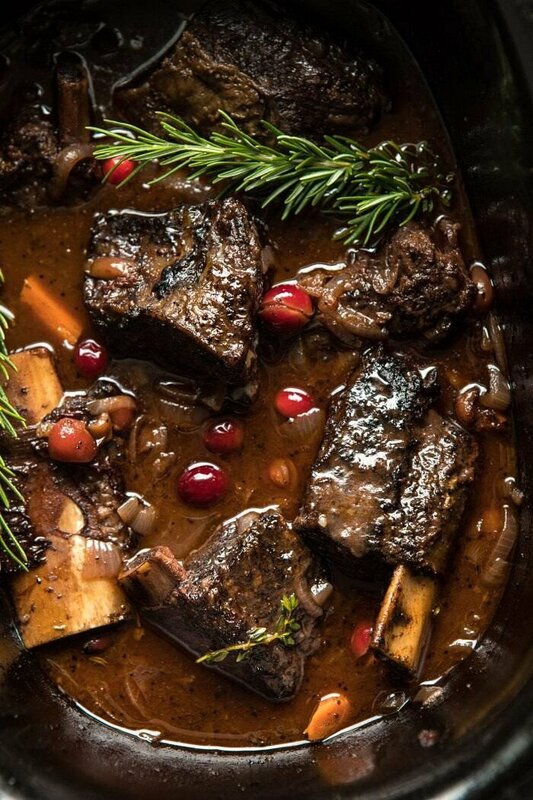 Slow cooked short ribs in red wine with fresh herbs and sweet cranberries. They're a one pot and done kind of dinner, festive, and totally delicious. Serve these over a bed of creamy mashed potatoes and you'll have the perfect dinner for a cold night in. 2. Season the short ribs with salt and pepper. Heat the olive oil in a large oven safe skillet, sear the ribs on both sides. Remove the ribs to a plate. Add the onions, shallots, and carrots, cook 5-10 minutes or until the onions begin to caramelize. Add back the short ribs. Add the wine, broth, tomato paste, brown sugar, thyme, rosemary, and bay leaves. Sprinkle over the cranberries. Season with salt and pepper, gently stir to combine. Cover and transfer to the oven. Cook for 2 ½ to 3 hours or until the short ribs are tender and falling off the bone. thank you for making me drool copiously before ten am!! Ah I am so glad you like this! Thank you Ruth! I love short ribs and these look fantastic – great work! Yum! This is going to be Thanksgiving Eve dinner. 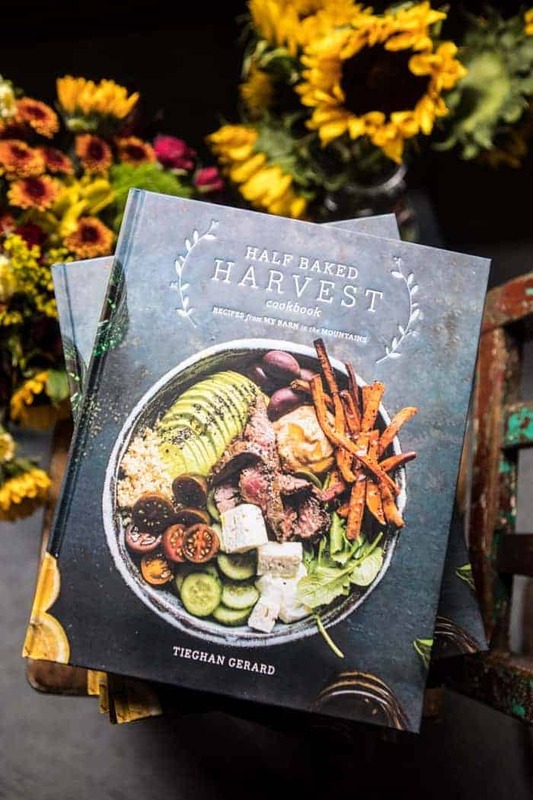 I committed to not grazing mindlessly all week, but actually planning other meals besides the feast, and this is perfect! Hands- off, delicious and the leftovers will be amazing! Enjoy the week with your family! Yes that sounds so amazing! I hope your whole family loves this meal, Dana! Thank you! YES! So perfect for Winter! I hope you love this Nora! I absolutely love braised short ribs! 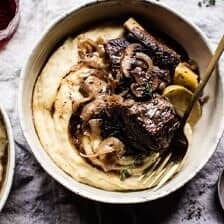 I recently made a recipe using boneless short ribs in the Instant Pot. I love being able to sear everything right in the pot and then setting it to cook. Could you provide cooking time if done in the Instant Pot? Love your recipes. Have loved every one I’ve tried! I made these last year for Christmas eve dinner. I was counting on left overs…. there wasn’t any. The were so good. My one suggestion is to use the pan sauce and make real gravy so it’s not as runny. Hi Jennie! I am so glad you loved this recipe and I hope you make it again this year! Thank you! 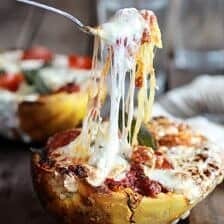 Can I do these in a dutch oven? I love short ribs! Can’t wait to try! Silly question, I already have boneless short ribs – would it be okay to substitute boneless for the bone in? 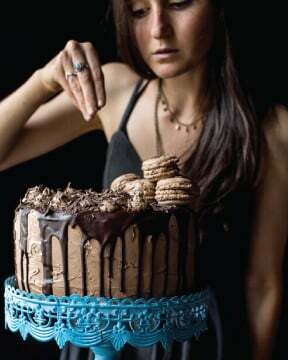 THANK YOU for yet another show stopper recipe! I have made this several times and it is always my go to when entertaining guests. You NEVER disappoint… keep em coming! My husband, children, and all others that have enjoyed a meal at our home thank you too! I am so glad you loved this recipe and others on my blog Liz! Thank you so much!! Do you have a few go to brands you choose when cooking with red and white wine? Would this work in the instant pot? They look amazing!!! 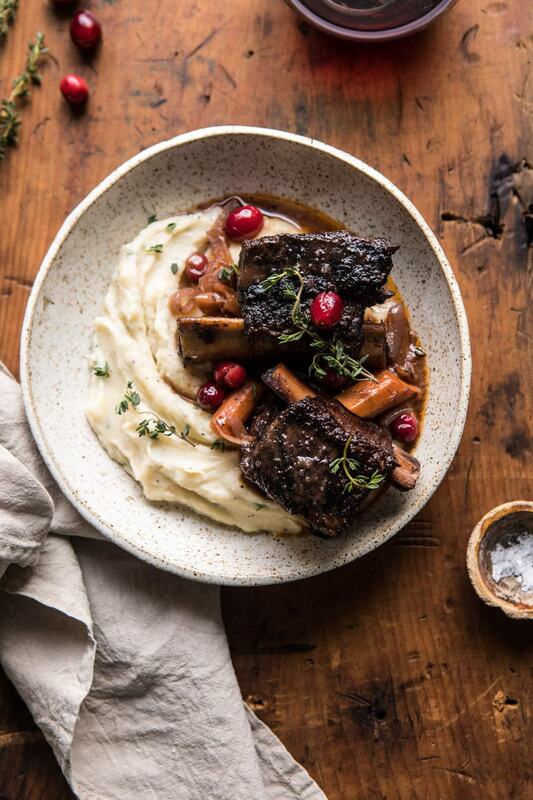 There’s nothing better than short ribs in the fall! These look so delicious! OMG this was DELICIOUS. Made it tonight. I usually don’t love short ribs, but i ate every last bite. The cranberries added a beautiful Tartiness that I loveddddd! So yummy! Hi Allison! I am so glad you loved this recipe and it turned out amazing for you! Thank you! We absolutely loved this!!!! Something so easy produced an amazing meal!!! Thx you so much. Hi Alicia! I am so glad you loved these short ribs! Thank you so much for making them! What would you substitute for the wine? Broth? Thanks! Have you tested this in an instant pot? Thanks! Love your recipes. Just ordered your cookbook for my entire family. This looks amazing! I was considering it for Christmas dinner. For the oven version, do you think it would work to prep it the day before and just have to put it in the oven on Christmas Day? Thx! Made this tonight, absolutely delicious! Love the cranberries. Making it again for a dinner party next week! Has anyone ever added garlic? I’d love to make this for Christmas Eve, but I have 8 guests. Can you give me suggestions how to increase the recipe to serve 8? Hi Tieghan! I can’t wait to make this for Christmas Eve dinner! How many pounds of short ribs would you recommend for 10 people? Delicious!! Very easy to make and everyone loved the flavor. As others have said, love the addition of the cranberries – gives it a nice sweet/tart pop. Made it with mashed white sweet potatoes since we’re not big mashed potato fans. Thanks for this recipe, another hit! I made this on Sunday, and it was a HUGE hit! I did add a little more salt to my liking to the broth. I love short ribs! Average, at best. This meal is expensive to prepare, takes a long time to cook, and requires more prep than I’d normally put into a crockpot meal. I expected better. Hi Sarah! I am so sorry to hear that you did not enjoy this as much as you thought. Are there any questions I could help you with? Please let me know. I hope this does not stop you from trying other recipes of mine! I am so glad you loved this Lynn! Thank you so much! Hello, would I be able to sub the red wine with non alcoholic cooking wine? This looks delicious! Is there any good substitute for the red wine, or would it really change the recipe? I would wait on adding carrots, they were overcooked when done as stated. Also I added 2 oranges cut in half with peel on, because I had them on hand and they pair well with the cranberries. Hi Julie! I hope this still tasted amazing for you! Thank you! So excited to make this for Chrismakah dinner with friends this week. Based on the cook time I would need to start this between 10-12 unfortunately I can’t be home then. 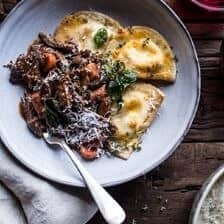 Would you recommend starting it early and having it keep warm after it’s done OR put it all in the slow cooker and set it to delayed start so that it then finishes on time? Thanks! How do you know if you should cook for 6 or 8 hours?!? Looks delicious!! Planning to make this for Christmas dinner. First, this looks so amazing that I have decided I need to make this Christmas Eve for the family! A couple quick questions: I love mashed potatoes (especially your herbed brown butter mashed potato recipe!) But the rest of the family is not huge on the potato as a starch. 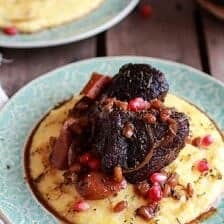 Thoughts on a creamy polenta as a substitute? Additionally, what vegetables would be good as a side? Roasted? Thank you for a hearty option for the holidays. I have a full house of 12 people for the holiday week and needed ideas ;-). I hope I can just double this recipe for the crowd. I always look to you now for inspiration! I hope this recipe turns out amazing for you, Sarah! Thank you so much! This looks delicious. My husband and I want to cook this for our Christmas day meal however, it is only the two of us. If we cut everything in half, how long would you recommend cooking it in the crockpot? Thank you!! I’ve been so excited to try this recipe for weeks!!! It’s all in my slow cooker! If my ovens were working properly I would have preferred to carmalize everything but fingers crossed. Such a beautiful dish, can’t wait for tonight! Thank you so much! I hope you love this recipe, Jill! Hi! I’m making this for Christmas Eve for my family, do you think it turns out better in the slow cooker or the Dutch oven?!? 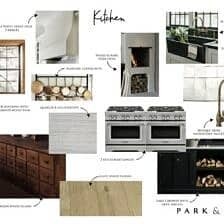 I came across your cookbook last Christmas and have pretty much cooked your recipes throughout the year and have loved everything! Hands down comes out better in the oven! My color was too pink in the crockpot so I switched everything to the oven and got that braised look. I also had overdone meat though, just a bit too tender and lost its texture. Im learning! My husband is not adventurist and fruit with meat is not his thing but it sure is mine! Will try again, in a dutch oven for sure, less cook time, cranberries in at the last 5 minutes, cook my vegetables first in olive oil to caramelize and I think that would master my version. Hi Jill! I am so glad you liked this recipe and I hope it turns out even better the next time you make it! Thank you! 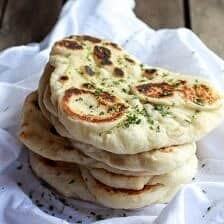 Can I make these in a ditch oven? This just made me change my Christmas menu! Looks delicious. I have 15 people for dinner, what do you suggest as far as how many pounds of beef and increasing the ingredients? Thank you! 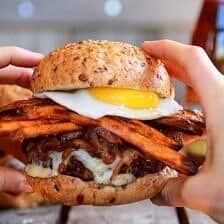 Can I use a Sous vide for this recipe? I am not familiar with a sous vide, so I really can’t say. I am sorry. Your recipes are making me look like a very good cook…made this for Christmas dinner and everyone was so impressed! The meat was perfection….literally fall off the bone and this recipe could not have been easier! That is so amazing! I am so glad everyone loved this Beata! Thank you! Made the braised ribs for Christmas lunch. It was delicious and got rave reviews from my peeps. I bought premade mashed potatoes and added a festive salad. It was an easy holiday lunch with not much personal inconvenience on my part. Great recipe. Made for Christmas, was easy and delicious! Left out the cranberries because my husband is weird about eating fruit in things. Cooked in a Dutch oven for 2.5 hours and was perfectly done! I am so glad you loved this Joanna! Thank you! Would substituting the fresh herbs for dried herbs work out? What would the measurement be, if so? I am in the process of making this right now in my Instant Pot…as a slow cooker… following your cooking directions. I have an hour left, ye gods I can’t wait!! Ah I hope you love this! Thank you so much! We made this last Saturday night!!! OMG delish. I don’t have a crockpot large enough but we cooked it in the oven for 2.5 hrs and it was divine! Can’t wait to make this again. Thank you so much Karen! I am so glad you loved this recipe! I’ve made this twice now and it remains one of the best meals I’ve ever made!! Perfect for a special occasion or cozy night at home. Thank you! This was a hit with my family:) thanks! can you use sugar free dried cranberries? I can’t seem to find a single store that still has fresh ones in stock! Hi- do you think the meat would be ok in the crockpot cooked for 10 hours? I made these yesterday and they were fabulous! One suggestion I have is to purée some of the veggies, cranberries, and juices after everything is cooked to create a nice sauce. I did this and it was amazing-the right consistency and flavour right out of the blender. It was a great accompaniment to the meat and mashed potatoes.